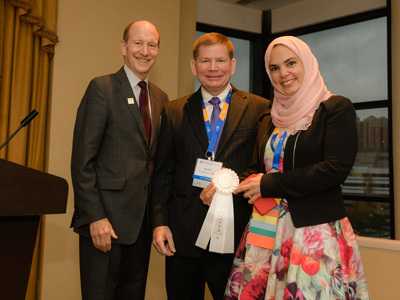 Dr. Walaa Ahmed, graduate prosthodontics student, placed third in the John J. Sharry Research Competition at the American College of Prosthodontists Annual Meeting, held in Baltimore, Maryland, on November 2, 2018. Her abstract, “Marginal Discrepancies of Monolithic Zirconia Crowns Under the Influence of Different Preparation Designs and Sintering Techniques,” was one of only six chosen as finalists for the annual competition. Finalists were judged by external peer-reviewed examiners with a weighting of 60 percent on the manuscript and 40 percent on the oral presentation. Ahmed says that having had the chance to discuss, ask and answer questions with such brilliant minds in the same room was a phenomenal experience and learning opportunity. “This has inspired me as a clinician and researcher, towards future projects that will further expand my horizons and will hopefully continue to positively impact the field of prosthodontics and dental biomaterials,” she says. Dr. Walaa Ahmed (R) with Dr. Geoffrey Thompson (C), ACP Research Committee Chair and Dr. Leonard Kobren (L), Chair, ACP Education Foundation.